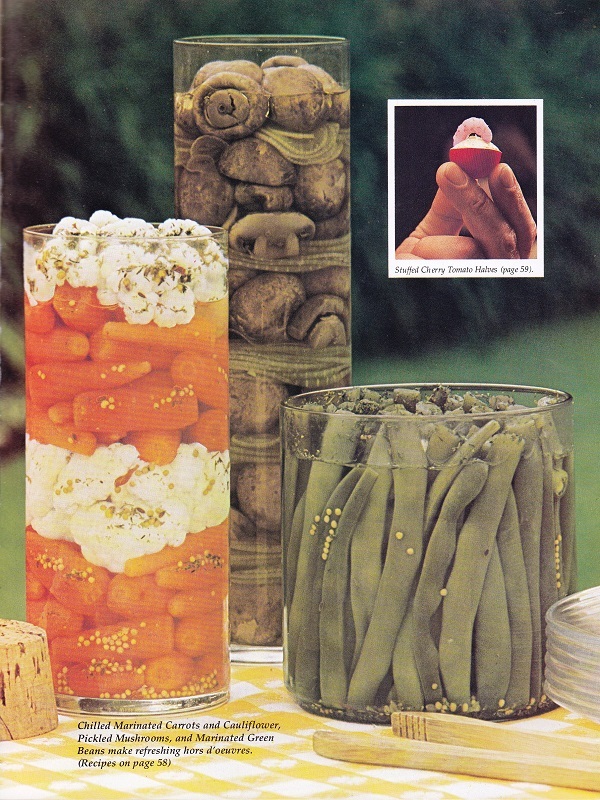 This came through my library’s donation pile the other day and of course someone said I just had to have this delicious example of late 1970s cocktail party food. Honestly, this could have been my parents’ party. I know both my mom and I sported the neck scarf look on more than one occasion, and “harvest gold” along with avocado green were THE colors of the late seventies. Have a groovy time in the kitchen with these fab recipes. But oh man, I am the hugest fan of retro cookbooks. Some of the stuff in there is just SO THAT ERA or so bizarre. Or, even better, so BOTH. Ugh, I just about dry-retched at that! I HATE cauliflour, and can take or leave carrots. I’m so glad I was born in 1978, and missed the horror. I didn’t even see the cauliflower, I was too horrified by those mushrooms! I love mushrooms but that presentation – BLERGH! It looks like a tubeful of colon polyps. Those pickled mushrooms look like something from the set of American Horror Story Season 1. 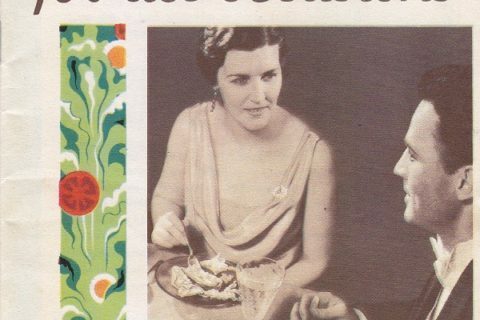 Why is the lady in the bottom picture wearing a pink nightgown to a party? She’s just keeping it casual. Maybe it is a house coat. Maybe a maternity dress. Back in the 70’s, maternity wear was tent-like. 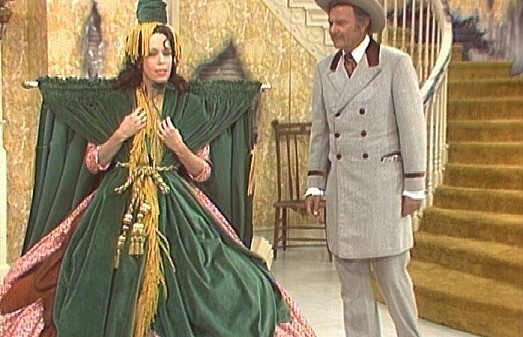 I suspect that glamorous garment is a 1970s maternity gown. Because what pregnant woman doesn’t want to look like a large baby herself ? She’s heading out to Walmart after the party? I’m wondering why the guy beside the bench has on a green velvet jacket with gray pants….. The guy on the right side of the third image just has me boggling. And I grew up in the 70’s! Time to let the sun set on this one. Hey Mary, since this was a donation are you going to sell this on the web? 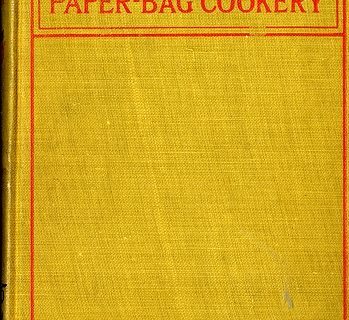 Cause my mom’s birthday is coming up in June and she collects old cookbooks. She also hates it when we buy her new stuff as gifts and prefers we kids buy her nothing or if we must, thrift shop for things like old cookbooks and the like. It’s available on Amazon for a penny. Mass sellers on Amazon sell so many books with no margin, and I can’t see how it would justify trying to sell those volumes online instead of in the library. What, no celery stuffed with cream cheese? Or cheese in a can on Triscuits? 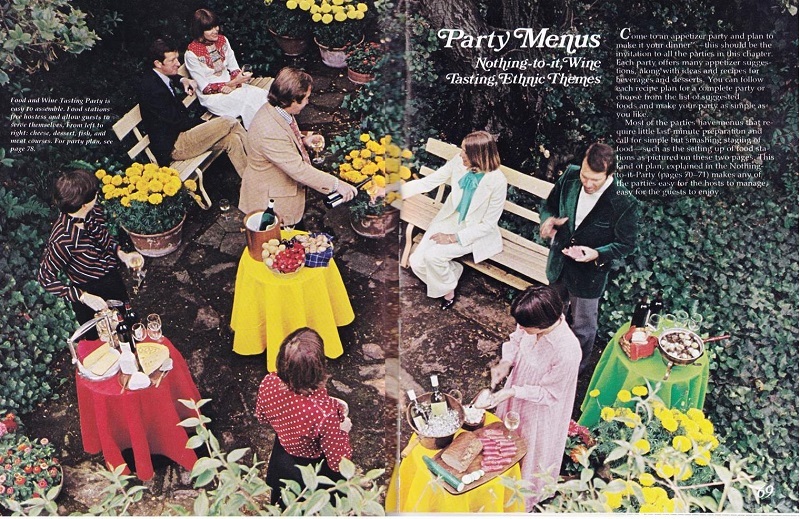 Those were party staples back in the day. 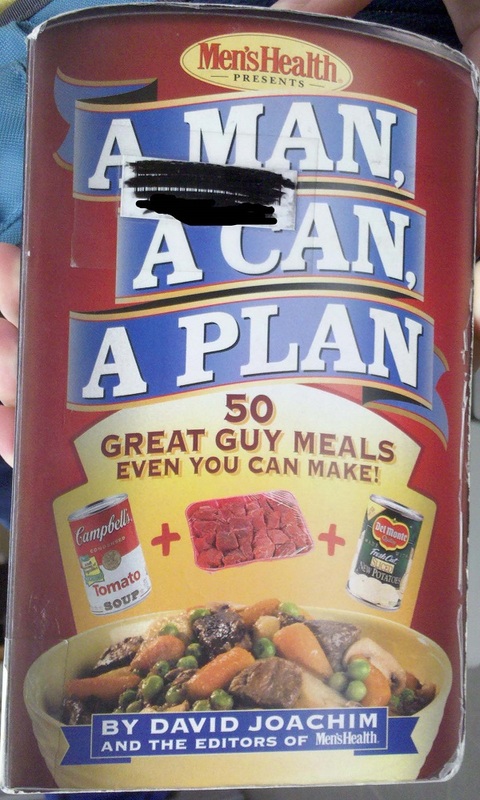 you don’t really need recipes for those. 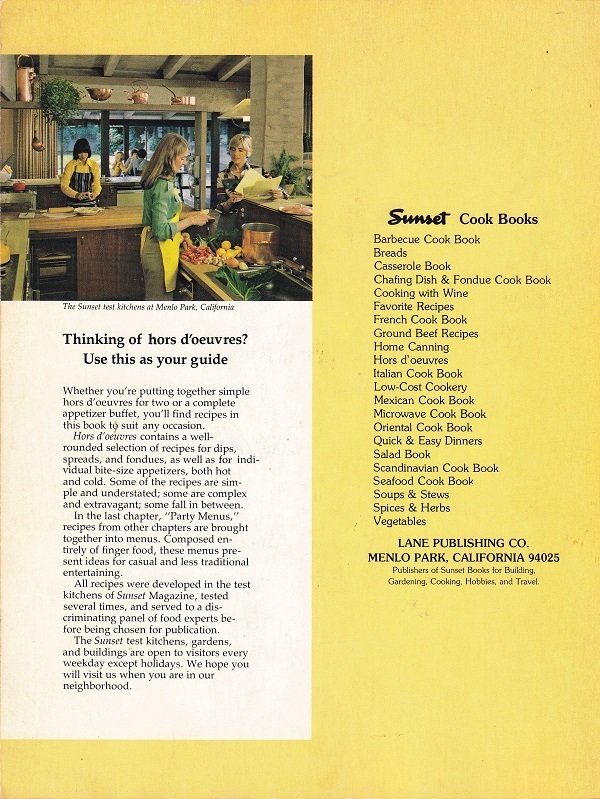 Sunset is a western us lifestyle magazine that also publishes great books like this on entertaining and gardening. I love all their old gardening books and pick them up at yardsales. These days the magazine is very trendy, and will tell you where the best food trucks are in the larger western cities. I can only hope that today’s stuff will be as amusing in 40 years! 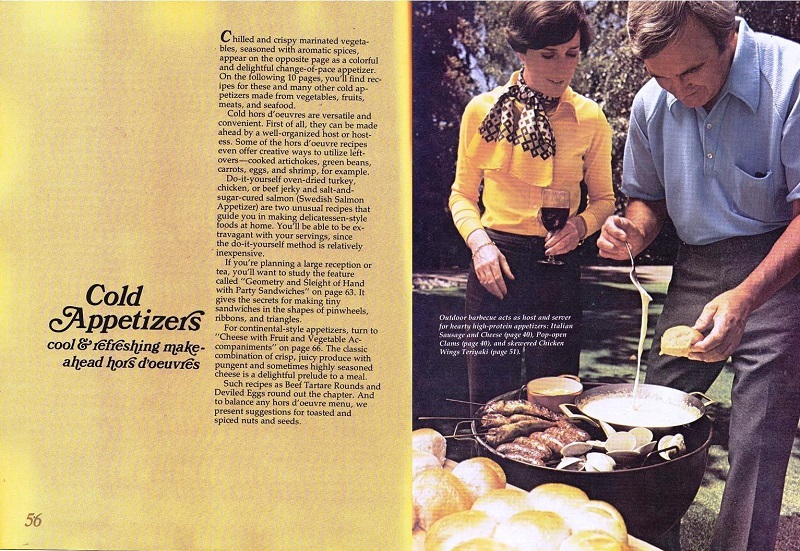 I will admit, the fondue on the grill looks kind of fun. The one fondue party I went to, it was so awkward with all of us scrunched around the table waiting for that tiny pot to heat up, and then you have to watch out bringing the fork to your mouth or bread or whatever because it drips all over. It makes a lot more sense at a barbecue. 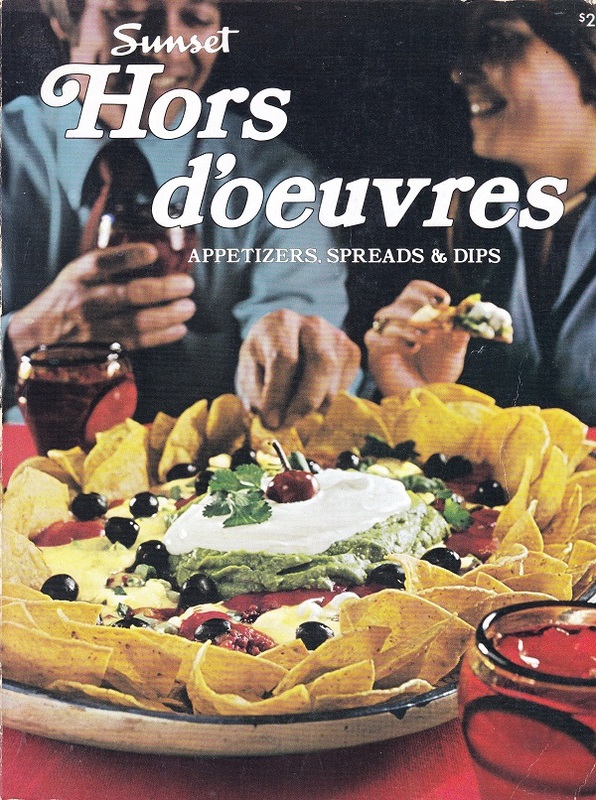 I would have been all over that plate of layered dip shown on the cover–double dipping and all. It was probably a pretty enjoyable party — they seem to have at least one bottle of wine per person! I think that the person in the pink outfit is a child. Probably she was allowed to come to the party before going to bed; compare her height with that of the green velvet guy. I was pregnant in 1974, and that pink gown, is not a maternity dress. I never saw a floor length one. No, it’s an adult in the pink; a 1970s Laura Ashley inspired floral dress. I remember them well and had something similar in around 1976, though not in pink. Can any one tell me what the linear objects are separating the mushrooms? I can imagine the acidic taste of those marinated vegetables. I did some retro Mushrooms a la Greque recently and I can say they have dated the same way the pink dress has. Fiona, I bet the things separating the mushrooms are onions. They have the telltale stripes on the edges. Green velvet jacket man looks like he’s gesturing as he talks to someone, but pink nightgown lady has her back to him…..also was this photo taken from the roof?